Courtesy photo from the Idaho Department of Fish and Game Blood tests confirmed the first instincts of officials who suspected the pup was more than the domestic dog that campers thought they had brought to a Ketchum vet’s office last month. 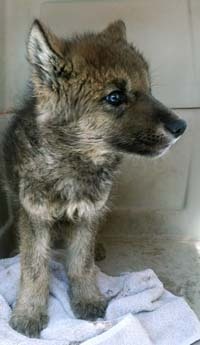 Staff at Zoo Boise, where the wolf pup is living now, are searching for a permanent home for the pup in captivity. A DNA test result showed that a pup picked up outside Ketchum on Memorial Day weekend is a pure-blooded wolf, state wildlife officials said Tuesday. "About all I can tell you is that it's pure wolf," said Mike Keckler, chief of communications at Idaho Fish and Game. Department wildlife biologist Regan Berkley said a couple picked the male pup up on the afternoon of May 25 within the Sawtooth National Forest near Ketchum. After calling the Ketchum Police Department, the couple was advised to take him to a local veterinarian's office. He was eventually taken to Zoo Boise, where he remains for the moment. Suzanne Stone, spokeswoman for wolf advocacy group Defenders of Wildlife, said the couple had sat by Warm Springs Road northwest of Ketchum for nearly an hour, waiting to see if someone—human or animal—would return for the pup. "As long as they were sitting there, the mother was never going to come back," Stone said. "Wolves are typically very fearful of people, especially when they have young to protect." Stone said she and Fish and Game Regional Conservation Officer Lee Garwood spotted wolf tracks off of Warm Springs Road that seem to tell the story of how the pup could have been lost. "They were pretty distinct," she said. "There was an adult wolf walking along one edge of the road. She or he had little paw prints around it, so there were a lot of small paw prints there, which indicated that there were additional pups." Stone said tracks changed when a car seems to have approached, dividing the group. "She and the other pups went one direction, and this little pup went another," she said. "He zigged when he should have zagged." Stone said a female wolf was probably moving her pups from a den that was still under the snowpack to a drier site when she was disrupted. "We speculated that female had been in there raising her pups and didn't expect a lot of human traffic," she said. But news that the pup is pure wolf comes too late for a successful effort to reintroduce him to his pack, Keckler said. "We recognized early that if this was a pure wolf, by removing it from the wild, it couldn't be reintroduced successfully," he said. Though Stone stated last week that she believed reintroduction could have been successful within a month, Defenders of Wildlife was given a two-week window by Fish and Game to find the pack and reintroduce the pup. She said efforts to find the pack have failed. "We really gave it our best shot," she said. "I guess it's not too surprising. The mother has just had one of her pups taken, so she'll feel like humans are really dangerous and want to stay away." Stone said she hoped the pup would find a home in a facility with a young pack that would be willing to adopt him as one of its own. Once wolves enter breeding age, she said, it's difficult for a pup to be accepted into that pack. Keckler said Zoo Boise is compiling a list of Association of Zoos and Aquariums-accredited facilities that might be willing to take the wolf pup in. Accreditation can be offered to wildlife parks, refuges and sanctuaries as well as rehabilitation centers, not just zoos and aquariums. But Keckler said that certification is a must for the pup's future home. "We've had a lot of calls from people offering to take the wolf, but we're not sure about their ability to care for it," he said. "[Zoo Boise] knows better than we do about the type of facility that could potentially take the wolf."